C&W, issued in 1977, was the only album from actress, singer, dancer, and comedian Carol Channing (who sadly died earlier this year just a couple of weeks shy of her 98th birthday) and Webb Pierce, honky-tonk vocalist, songwriter and guitarist and one of the biggest country stars of the 1950s, whose band included such stellar musicians as pianist Floyd Cramer and guitarist-vocalist Faron Young. Referred to on the reverse of the album sleeve (twice, no less) as “this unlikely duo”, the couple on the front of the sleeve look like they’re going to a Hallowe’en party, not a recording studio. 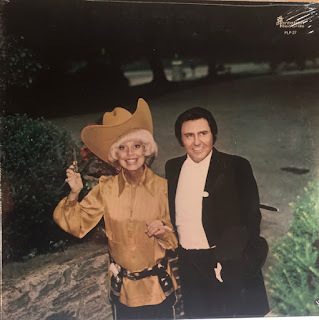 Carol brandishes one of her toy guns as she walks arm in arm with Webb, whose badly dyed bouffant makes him look like Johnny Cash impersonating Dracula. But it’s the music inside that really grates. Carol’s trademarked cracked voice is no match for Webb’s baritone. Thank goodness the whole sorry assemblage only lasts for less than half an hour. Issued by Shelby Singleton’s Plantation records, C&W includes reworkings of some of Pierce’s big hits, but the pairing of country legend and Broadway superstar just doesn’t come off. Bizarrely Channing and Singleton thought otherwise, and Channing followed this album with another for the label, a collection of duets entitled Carol Channing and Her Country Friends. In his later years, Pierce became known for his excessive lifestyle. He had North Hollywood tailor Nudie Cohen, who had made flamboyant suits for Pierce, line two convertibles with silver dollars. He built a $30,000 guitar-shaped swimming pool at his Nashville home which became a popular paid tourist attraction — nearly 3,000 people visited it each week — causing his neighbours, led by singer Ray Stevens, to file a court action against Pierce to end the tours. A peculiar little song-poem/vanity hybrid for you today, originally unearthed many years ago by fellow blogger Bob Purse. 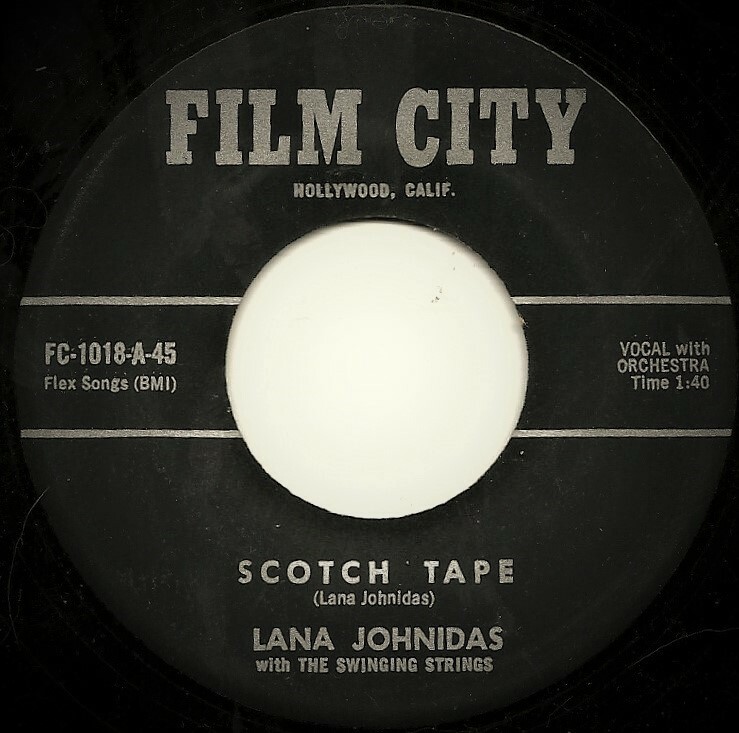 Scotch Tape/Close to You, credited to Lana Johnidas and the Swinging Strings, was an early release from Sandy Stanton’s Film City label, which means it was issued circa 1964. Being that early the chances are that the Swinging Strings – Sandy’s ever-present Chamberlin – are played by either Sandy himself or the great Rodd Keith. Both songs were written by Ms. Johnidas, and my feeling is that she probably paid for this disc to be cut to demonstrate her songwriting prowess, for shortly after she joined the ranks of Hollywood-based Our Productions/Your Management, whose offices were in the Capitol Tower on Sunset and Vine. Her career as a performer/composer was managed by Michael Goldberg, who also looked after the careers of such stellar names as Friar Tuck, the Plastic People, Jacobson and Tansley, and Epic recording act The Kaleidoscope. Sadly, it does not look as though that career amounted to much, as outside of this one disc I’ve been unable to find a credit for Lana on any other record. A shame, because this is a fun little record and her voice, with that hint of a giggle in it, is rather infectious. That’s about it. As usual, any further info would be appreciated. Thanks Bob, for unearthing this gem.